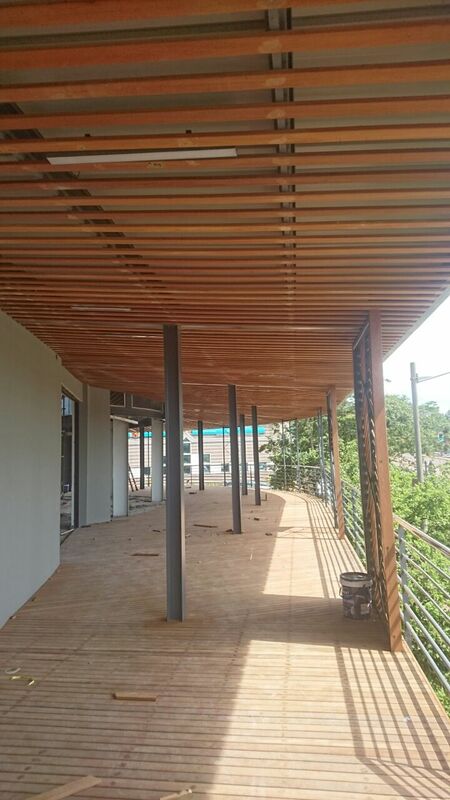 Besides offering a full wooden deck building service in Durban of supply and install, we also sell balau deck boards to end users for use in wooden decks in Durban and KZN. Please use the contact us form below to enquire about deck building services or read on for more info on sale of deck boards and decking materials. 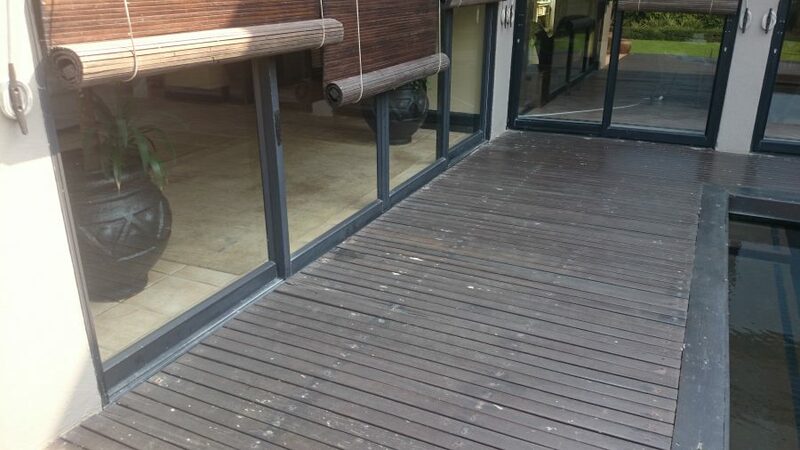 Because we secure our balau deck boards in bulk we are able to offer these deck boards to the wooden deck builder or end-user at a highly competitive price and more competitively than your popular outlets in Durban. We stock largely 19mm x 68mm and 19mm x 90mm wooden balau deck boards but other sizes and species are also available, on request. We stock a range of lengths from 2.4m to 4.8m. Please check with us what we have in stock before ordering and provide us with the rough dimensions of your wooden deck so we can select the correct lengths for you to minimize waste. If for instance you are building a wooden deck measuring 4.8m then you would opt for 2.4m deck boards and space your joists with centres of 400mm or 480mm (but not 450mm or 500mm) as these are all factors of 2.4m. On the other hand if your wooden deck measured 5.4m long then you would opt for 2.7m deck boards and space your joists with centres of 450mm or 540mm being a factor of 2.7m. This way the off cut at the end of each deck board is minimized and a saving can be obtained. I will gladly help you plan your substructure and deck boards so as to build a structurally sound deck and minimize waste. Contact me below with the size of your deck and the height above ground. There are mainly two different types of balau that can be purchased, red and yellow balau. In my experience the yellow balau is harder and therefore more durable. The red balau I have bought in the past seems to be more porous and will therefore absorb more water and rot more quickly. Although balau is very hard, contains natural oils and resins and repels water naturally all wood will eventually rot. 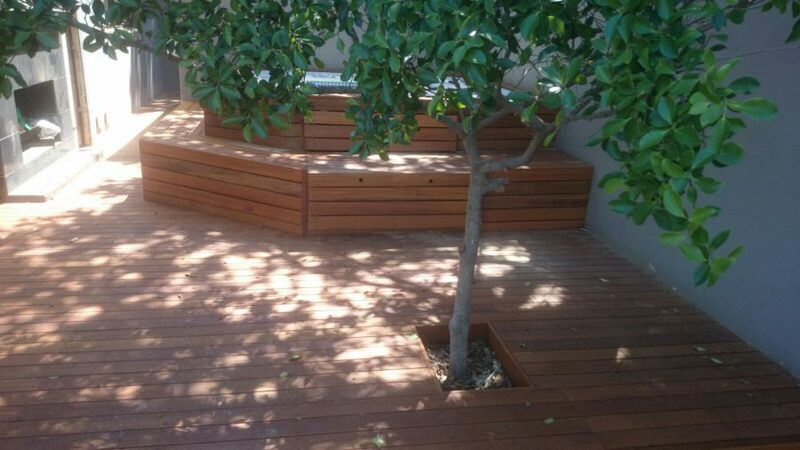 The aim is to choose a decking timber that will outlast other timbers but is still affordable and easy on your pocket. We stock only yellow balau. We sell mainly reeded deck boards. These are the deck boards with grooves on one side. The grooves are not there for anti-slip as is commonly thought. They are in fact there to be placed down against the joist. The reason is to allow any trapped water to dissipate quickly. By keeping the water away from the gap between the deck board and the joist will reduce rot to a degree and result in your wooden deck lasting longer. It is not absolutely essential but does help to some degree. Also by having the grooves up you cannot epoxy the screw holes closed, because you can’t sand it off due to the grooves, thus allowing more water to pool in the counter sunk screw hole causing accelerated rot. Grooves up also traps dirt and grime which actually causes the deck surface to become more slippery than a smooth surface. So always grooves down. 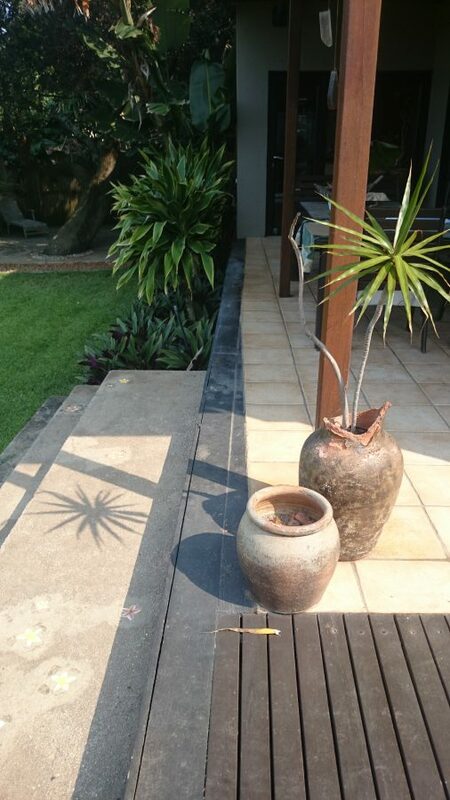 We are able to deliver in the greater Durban area. Please enquire about delivery charge. 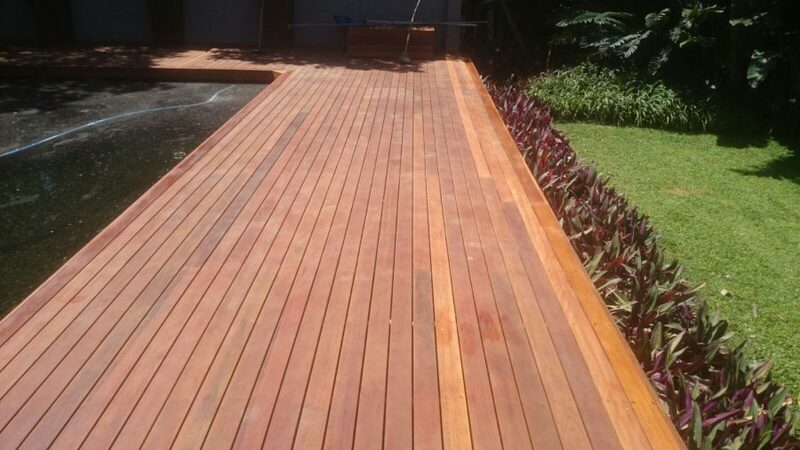 To contact us for a full wooden deck building service in Durban, or to order deck boards and other timber decking materials, you can call us on 031 – 762 1795 or use the contact us form below. The Owen Kemp Building at Hillcrest Corner, is being refurbished and there are two restaurants coming in to the space which was Mr Price. The entire shop is being revamped and changed to accommodate these two restaurants and we have been appointed to attend to the balau ceiling work, decking and cladding of various entrance ways and some screens. This article will deal with the ceiling work. A steel fabrication company has installed a steel structure on top of which they have installed roofing material. Our job is to now to clad the underside of the steel purlins and battens using 19 x 68mm balau deck boards with a 90mm gap which will accomodate flush mount LED lights. 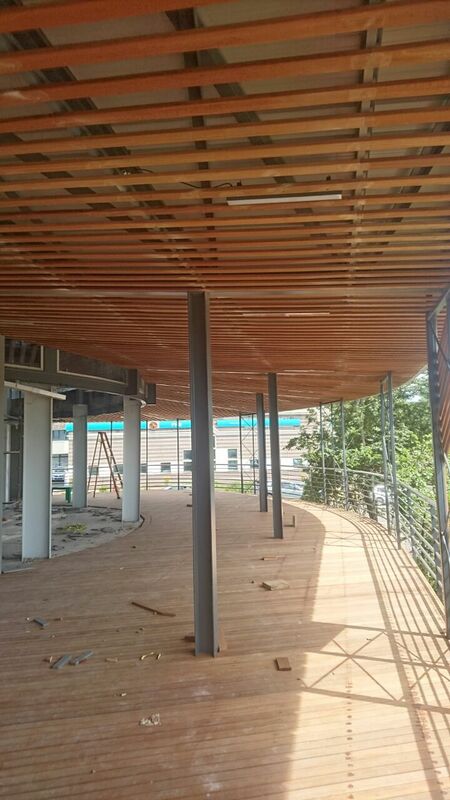 One can’t attach the balau deck boards directly to the steel structure so we’ve built a mini timber structure on to which we will attach the balau planks. We needed to build it so that the bottom of these boards were flush to the bottom of each I beam as the I beam itself will remain exposed and visible. Cleats and battens were attached to the steel and then painted to match the colour of the steel itself. Deck boards were then fixed to these battens with a 90mm gap. The gaps of 90mm are to accommodate a bracket which will be used to fix LED lights which will be flush with the bottom of our boards. We installed the brackets once we had already installed the boards to make it easier to get the alignment right. We drilled through the board and counter sunk a nut and bolt which will be filled with epoxy to cover the bolt head. The lighting company then installed their lights into those purpose made brackets. On the long straight section the boards were relatively easy to install as they followed the profile of the roof sheeting which was parallel to the I beams supporting them. At the corner the I beams no longer run parallel to the profile of the roof sheeting so we installed our boards still parallel to the profile of the roof sheeting but mitred at an angle to the I beam resulting in a very neat finish. The difficulty in this type of job is drilling through the 12mm I beams to fix the cleats securely. Also the height slows the job down as one is working above one’s head on scaffolding. On the screens we need to fix a cleat on the outside of the building between screen steel frame and balustrade. We drilled form the inside using a magnetic drill as the wall of the steel was about 8mm and it was virtually impossible to drill from the outside through 8mm of steel. Still there were at least 300 holes to drill in this manner. It is much easier to install wood on to steel if the steel has been pre drilled before fabrication. There is still a deck to come below this ceiling and screens at various points. I will follow up with a separate article on these other items. 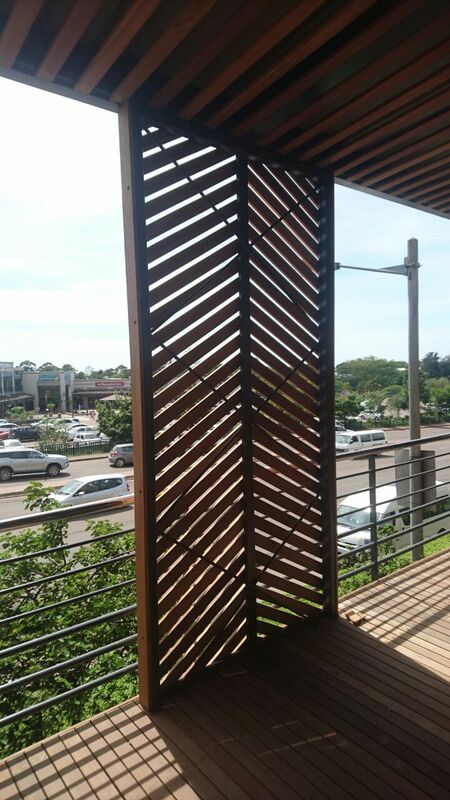 For a quote on your sun deck or other balau timber cladding or screening please contact us on 031 – 762 1795 or use the contact us form below. 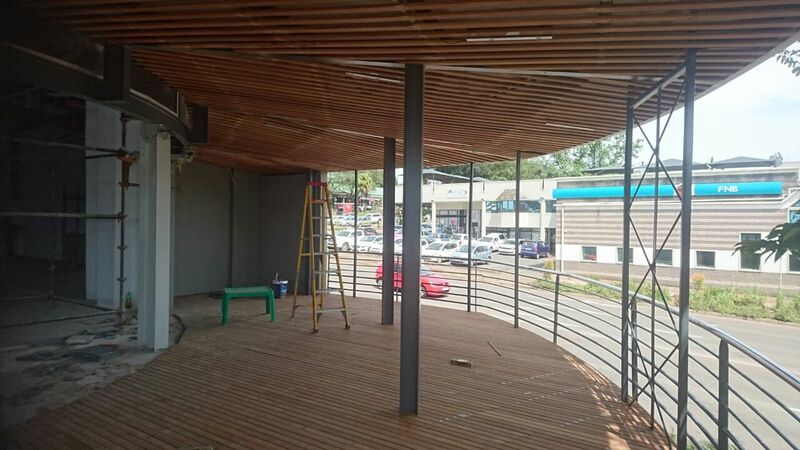 Here’s an indoor wooden balau pool deck we built in Estcourt KZN recently. The client had been doing some renovations on his house and had enclosed the pool with brick walls and windows resulting in an indoor pool. He wanted a wooden deck around it to finish it off nicely. Careful consideration was needed to ensure that any water from the pool could quickly drain away so as not to remain wet beneath the deck boards for too long. Of course with an outdoor deck any rain water or pool water evaporates quite quickly and isn’t of that much concern. Being indoors however this water can get trapped below the deck for some time resulting in premature failure of the timber. Although the timber is H3 CCA treated, and as such can live outdoors with periodic wetting, it cannot remain wet constantly. H4 CCA Treated timber is more suitable for damp conditions such as constant contact with wet soil. But a fair amount of water on an ongoing basis is not a good idea. 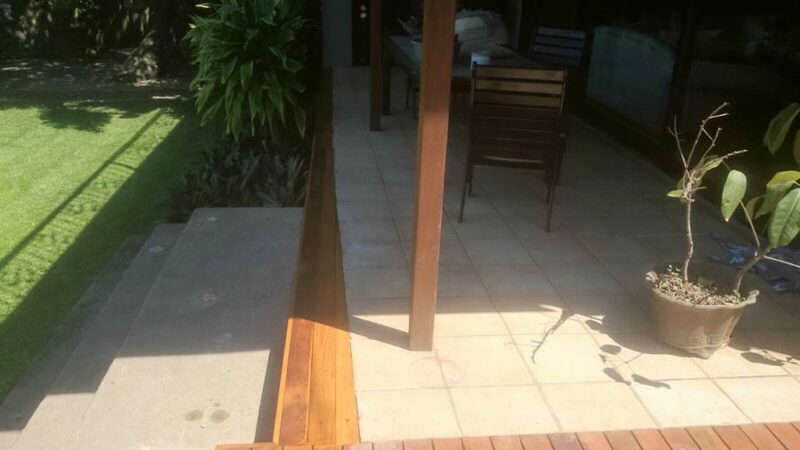 In this instance the builder had done a great job in creating a small fall on all four sides of the pool so that any water dripping or splashing on the deck would fall back into the pool rather than sit below the deck. The job was relatively easy as there was very little difference in distance between the walls and the sides of the pool. If the wall is not parallel to the pool then it will result in a wedged shaped deck board either up against the wall or the pool. To counter this one must “fan” the deck boards by making the gaps on one side 1mm smaller than the gaps on the other side effectively gaining 1mm per deck board. After 20 deck boards you will gain 20mm to make up any difference. In fibre glass pools one might also find that the edges of the pool are not straight. Run a fish line along it to see if it bulges in or out and find the straightest side to start your decking. 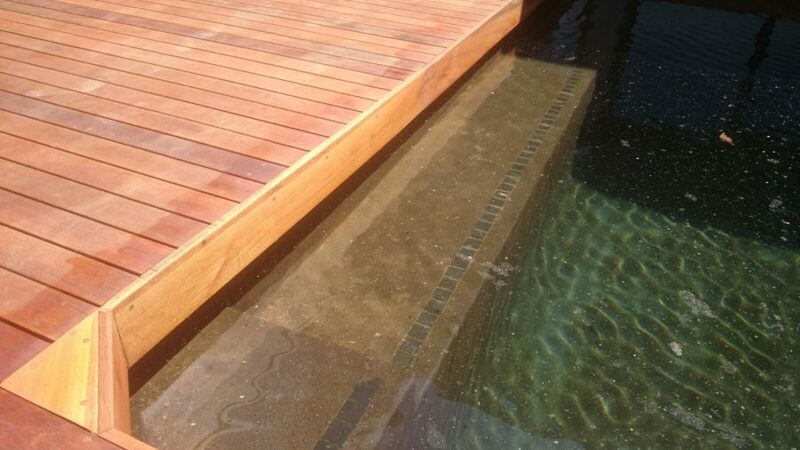 If it does bulge then you will need to overlap your deck board on the pool side slightly to cover that and keep the deck boards straight. A simple single deck board as a fascia board on the inside of the pool finished it off nicely. It was oiled with a deck oil and this deck will require very little maintenance or re-oiling as it is indoors and won’t get any sun. 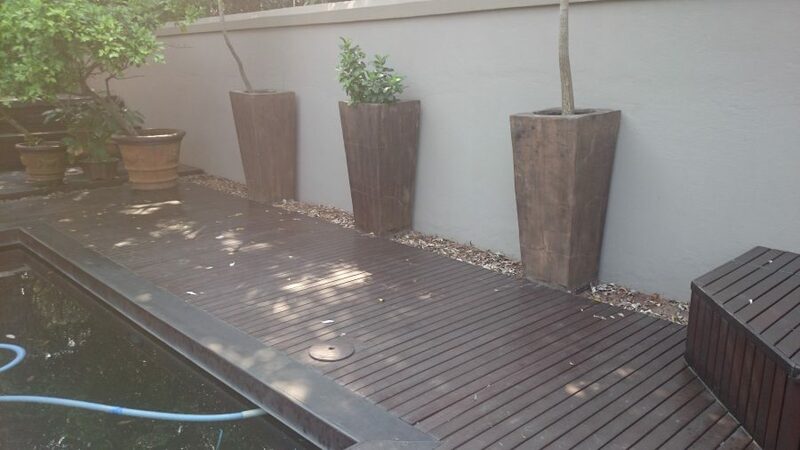 Call us on 031 – 762 1795 for a free quote on your decking requirements. We also supply and install balustrades, pergolas, walkways, bridges, jacuzzi cladding and pool pump covers. 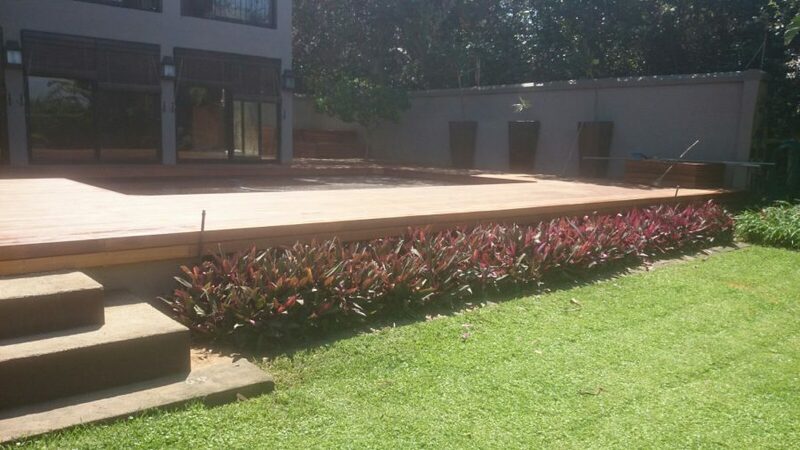 Here’s a wooden pool deck we built in La Lucia, Durban recently. In the gallery above you can see pics of the old deck and then pics of the new deck. The old wooden pool deck had started to rot at critical points. The reason for rot in many wooden decks is that the screw holes are not plugged, water gets in and travels up the end grain of the wood resulting in rot at the screw holes. Water travels more easily along the end grain of wood than the side or face grain. So it is important to seal the end grain as far as possible to prevent this. In the case of the end of deck boards the water never really gets trapped so it can drain away quickly enough to prevent rot. However in the case of a screw holes water collects in the screw hole and then has enough time to be absorbed by the end grain before it evaporates. As a standard procedure we fill counter sunk screw holes with epoxy to prevent this from happening. The epoxy we use is clear so that saw dust can be mixed with it to match the colour as closely as possible. It is also slightly pliable. In hot and cold weather, wood expands and contracts, as does most materials. If you consider a screw hole. The sides of the screw hole will expand thereby closing the screw hole or making it smaller. Whatever is in the screw hole, as a plug, will also expand. So if the screw hole is getting smaller and the plug is getting bigger it makes sense that whatever is in there will likely try to “pop” out. Using a slightly pliable epoxy can reduce the chance of this plug popping out. Hence the reason for not using solid wood plugs cut with a plug cutter. The epoxy should be pliable enough to take up the expansion of the screw hole but hard enough not to degrade due to weather conditions. 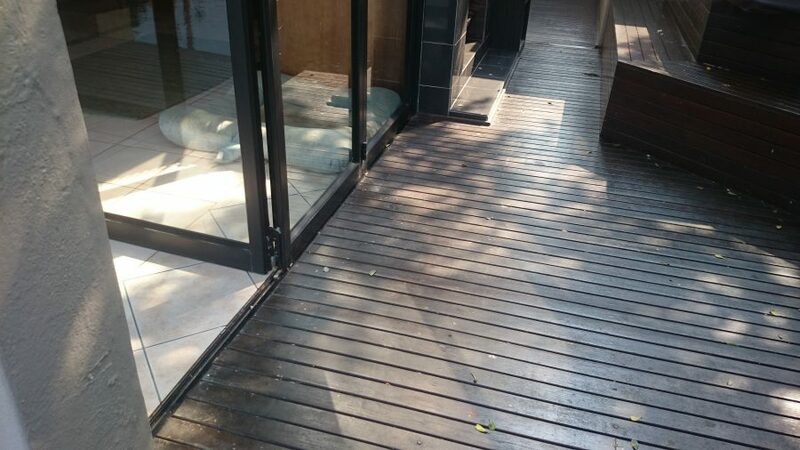 We used 90mm balau deck boards on this deck. They are slightly more expensive but some clients prefer them to the standard 68mm boards. Being a wider board one needs to secure them on both shoulders on each joist rather than just a single screw in the middle of the boards, as is the case with a 68mm board. The job took a bit longer than I would have liked because the substrate that we were building on top of, paving and concrete in this case, were quite uneven so we had to shim and trim joists to get the top of our joists level, flat and at the desired height to be flush with the inside of the house. The jacuzzi cladding was also quite tricky because we had to build a removable structure so that one can access the front of and below the jacuzzi. 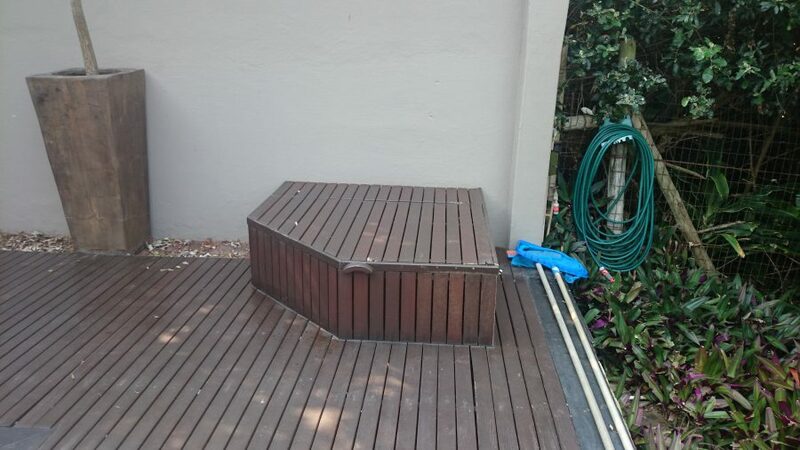 One side of the jacuzzi step is also wider than the other one so the corner required some fancy carpentry work in order to get the boards to line up and match. I’m glad I took so many pics of the deck before we removed it so that we could copy it exactly. There were also some wedges that we had to cut along the front edge as the tiles and existing patio were not square to the wall we were building our wooden deck up against. Whenever the existing buildings are not square there is always some sacrifice one needs to make and the trick is to get it least visible to the eye. In this case the client wanted the wedges rather than cutting the tiles or bringing the front of the deck past the line of existing buildings. 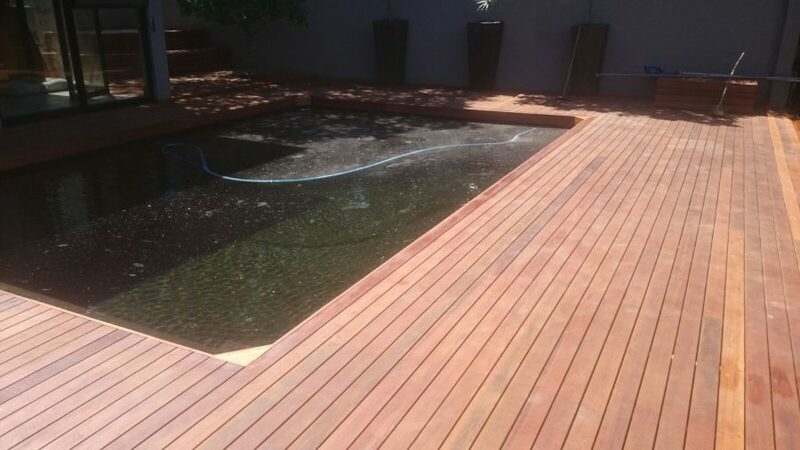 For a free no obligation quote on your wooden pool deck, or other balau timber construction, please call us on 031 – 762 1795, or use the contact form below and one of our representatives will get in touch with you. 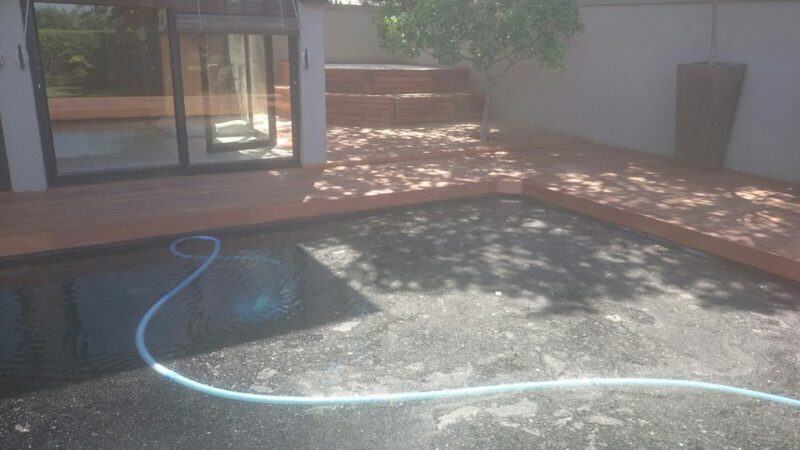 We built this wooden pool deck in Summerveld, Durban in July 2015. 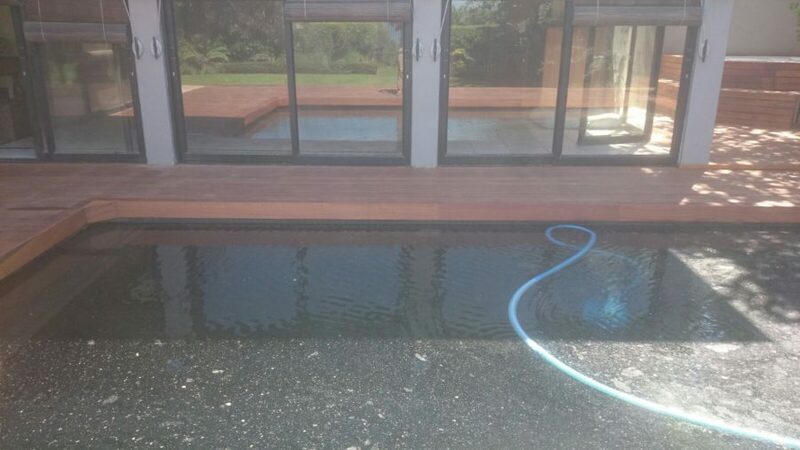 There were various challenges in this wooden pool deck build which tested our skills somewhat. Firstly the ground in Summerveld is very rocky, in fact in some areas it is just one large rock, and when digging you are actually making a small hole in a large piece of rock. There were 21 holes in total on this wooden pool deck so digging was slow and costly. From the pics you can also see that the edge rim of the pool is a rock feature so it is not level or flat and we had to try to get our deck height to a comfortable level for access from the rock rim of the pool on to the wooden pool deck. We also had to then try to conceal the gap between rock and deck as far as possible and as neatly as possible. In some areas it took a full deck board as a fascia and in other areas it was tapered down to a half width deck board. We ran deck boards perpendicular to the pool to avoid having long thin slivers of deck board on the pool side. When we started out the deck was planned to be half the finished size. As it took shape it was decided to extend it to its final measurements which was a double-edged sword for us as we had to dig even more holes through the rock but it increased our surface area and therefore our earnings. So we put on our big boy pants and carried on. The ends result was that the deck now extends past the front of the house so that when you are standing on the front you can see all the way along the front of the house. A pool pump cover was added, a full balustrade around the whole deck and we clad the open vertical gaps so that one cannot see below the deck. 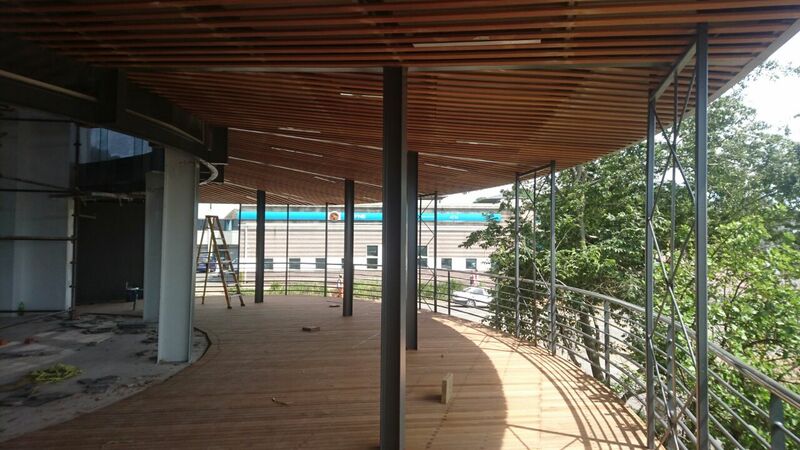 In one of the pics above you can see how we have returned the balustrade at 90 degrees on the first corner. This is to give the long run of balustrade perpendicular to it more strength. Long straight runs of balustrade can often become quite “wobbly” and this corner gives it good strength. We opened a gap in the existing post and rail fence and built stairs from the garden at house level to the pool with a hinged gate and latch. Because of the angle of the stairs, and to prevent digging too deep into the ground at the top of the stairs, we built a small landing. A short free-standing balustrade was added along the electric fence to provide some protection from the electric fence when accessing the lower garden on the right hand side of the deck. 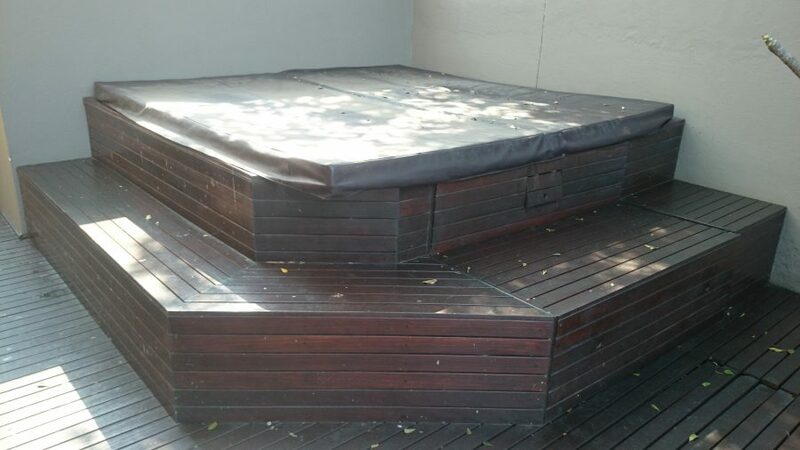 For a free no obligation quote on your wooden pool deck or other outdoor timber structures please call us on 031 – 762 1795 or use the contact us form below. 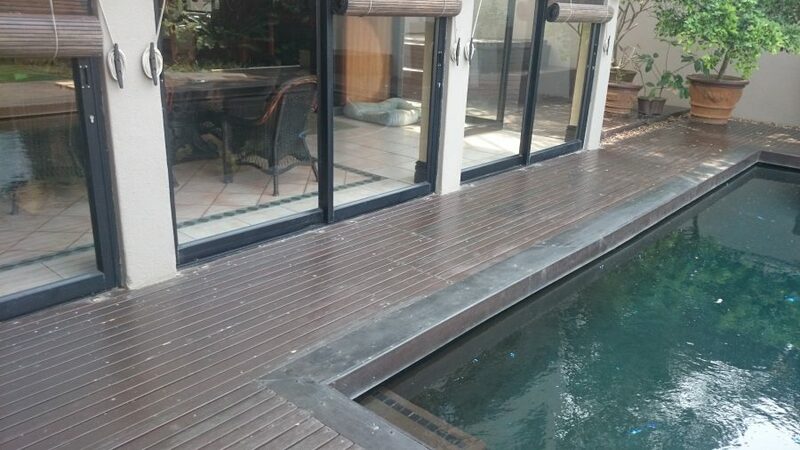 This wooden deck was a simple pool deck that we built in Kloof, Durban. The pool had originally been built at an angle to the house which limited the available space between the house and pool. The client wanted to create a wooden deck that was parallel to the house so that he could maximise the space between the edge of the pool and the house. As result we needed to build part of the wooden deck over the pool and the trick was to support it sufficiently over about a 3.5m span so that it didn’t bounce or sag. We couldn’t of course put supports or posts into the pool so we increased the size of the beam running over the pool to a 50 x 152. We still had to trim the 152 down to about 140 as we needed to install this beam on top of the existing pool coping, on both sides, and we were limited by how high we could come up from that surface. In these instances one starts “stealing space”. A term we use at The Wood Joint for gaining every available millimetre possible in order to maximise structural strength. We then clad the downpipes and support posts of the existing awning with deck boards to create two fairly large wooden posts and hide the PVC downpipes. This gave the effect of large wooden posts holding up the awning. The flower boxes were also clad to match the theme. A small ledge of about 200mm wide was added along the wall running up to the pizza oven at bar height of about 1.2m from ground. A small cupboard was built in the recess that the builder had left on the right hand side of the braai in which glasses and other braai, or bar, utensils can be stored. Stainless steel hinges were used aluminium knobs were fitted. We used a normal latch system on the inside so that when you close it, it locates behind, and out of sight. We included a single shelf for glasses. We tucked the deck underneath the braai area so that wood and charcoal can be stored there. 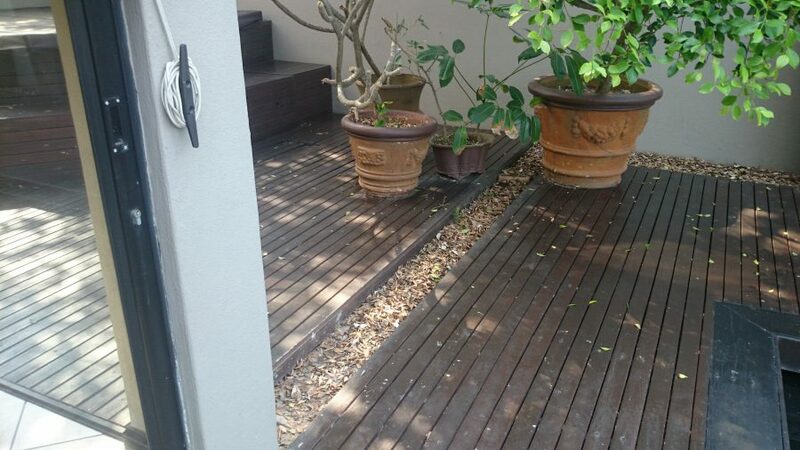 This deck was sanded and sealed with an oil based sealer. An oil based sealer is far superior to a water based sealer or mineral based sealer that dries on the surface. Oil cannot peel and flake. 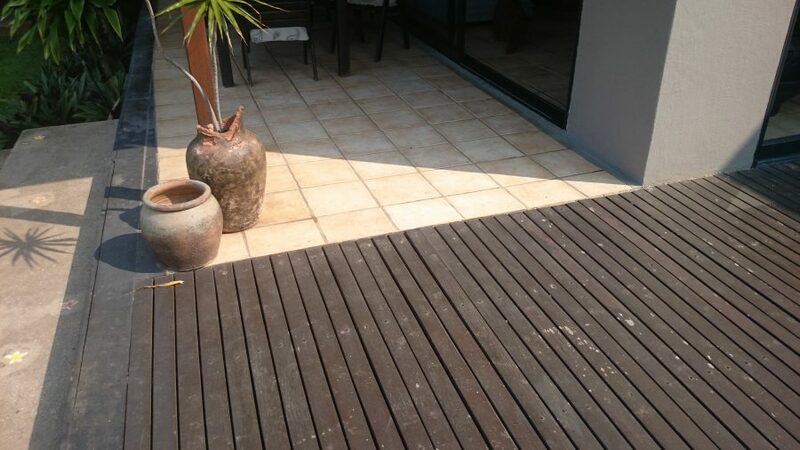 It simply disappears with exposure to UV so there is no need to sand the deck in the future. We are available to quote on your decking needs. Please call us on 031 – 762 1795 or use the contact form below.